ii. Where leave salary is received in any earlier year from a former employer and again received from another employer in a later year, the limit of Rs 3,00,000 will be reduced by the amount of leave salary exempt earlier. iii. Relief u/s 89 read with Rule 21A can be claimed by the employee in cases where the amount of leave encashment is fully taxable. Example: Mr. Gupta retired on 1.12.2017 after 20 years 10 months of service, receiving leave salary of Rs 5,00,000. Commission : Rs 500 p.m. Bonus : Rs 1,000 p.m. He was entitled to 30 days leave every year. (a) He is a government employee. (b) He is a non government employee. Please clarify, PSU employees are not not government employees is it correct? If it z correct plz provide correct evidence. I am State Government employee. I am in service at present. After retirement Earned Leave encashment is exempted from Income Tax. where in service employee are exempted for Surrender Leave or not may kindly be clarified sir. In Income Tax Act/Rule 10AA(I), there is mention of only earned leave. That means exemption is allowed only on encashment of Earned Leave and not sick leave. Is leave encashment taxable for employee of private aided institution where he gets salary from state government? Is IIM a Central Government office to take full exemption under S.10(10AA)i of IT Act for Leave salary at the time of superannuation? My uncle received Rs.4,96,890/- against Leave encashment after retirement of National Insurance Company Ltd. please tell me how much amount taxable. IS RESIGNATIONS FROM JOB AMOUNTS TO TERMINATION? WHAT ABOUT LEAVE ENCASHMENT RECD ON RESIGNATION? Employees. Pl quote section or judgement . By it law. Has it been defined in act itself. I am an employee of an Autonomous Body under Ministry of Human Resource Development, Govt of India.We are equally treated as Government employee. I have applied through proper channel to some other Autonomous Body under MHRD. Now I have tendered my Technical Resignation upon my selection to another Autonomous Body. I have accumulated approx leaves of 150 days (including EL/ HPL). As per the rule 39(2B) or so, I shall be encashing all the leaves at my credit, for which exemption prevail in line with the available provisions under section 10(10aa) of Income Tax Act, as learned from various sources. But my Account Officer is stating that the receipt of amount towards encashment of Earned Leave will be taxable, which is contradictory to what section 10(10AA) states i.e. the leave encashment of government employees is exempted. I would really appreciate if you could enlighten/ guide me on the issue before it is escalated too much. I received leave encashment which i changed companies. My ex employer has not mentioned the same in Form 16 and TDS has been deducted on the total amount i received as part of full and final settlement. how to i claim relief while filing my returns. which ITR should i use and under which head should i mentioned the leave encashment amount in form 10E. sir, I retired from bank and got leave encashment of rupees 844385/-. Out of this amount rupees 3 lac is fully exempt. Kindly inform me whether this amount is to be shown alongwith rupees 1.50 lacs investment under section 80c or some other place. I am working in state govt.i received leave encashment in current month is it taxable? Certainly. While on service every leave encashment is taxable to you. In the financial year 2015-16 I have worked at two PSU. Hence i have two form 16. I resigned from the first PSU after working 5 year 8 months and hence i got leave encashment and gratuity at the time of resignation. Now my question is which form to fill up for IT. Even I am looking for same details(Leave encashment policy benefits) as per our shops & Est Karnataka for our employees. Please explain the position of bank employees vis-a-vis govt/non-govt. employees for the purpose of getting exemption of leave salary amount on retirement. The Status of leave encashment for BANK employees ? Whether they come under Government or non government ? What is the status of tax on Gratuity received above Rs 10.00 Lakhs in case of Bank Officers ? 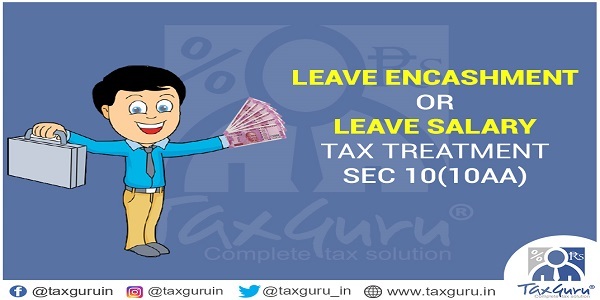 A quick Question w.r.t Leave encashment tax treatment for NON-GOVT employee in case of seperation (not termination) – Can this exemption be availed only once in Lifetime or more than once in case of more than one jobs at different companies. Please advice asap. Your answer to this simple question was so impressive. It has prompted me to seek your guidance in a matter. Please guide me on this. I am confused. ” A property was in the name of three persons – Son, Father & Daughter-in-law. While purchasing of this flat at Rs 19.12 lacs , contribution came from son(12.00 lacs) and father(7.12 lacs) and NOT from the daughter-in-law. This flat was sold, in 33 months after the purchase, for Rs 22.11 lacs (which was also the government price) thus giving an STCG of app. Rs 3 lacs. 1. Can Rs 2 lacs be reported as STCG in the son’s ITR & rest Rs 1 lac in the ITR of the father ? 2. What should be taken as Acquisition Cost , Selling Price & Govt Price for the son’s ITR ? I retired on 30apr.15.My basic salary was rs46000.I received rs 92000for pl encashment and rs 92000 for sl encashment. So whether both amount should be tax-free or one amount should be tax-free. Kindly advise. The Status of leave encashment of PSUs, BANKS, LICs etc. may be explained.